July’s blogs and my social media posts are all centered around the theme of freedom. Personal freedom. Freedom to think and say what you want. Freedom to explore. Freedom to succeed. Freedom to begin again. But there’s always a downside when we have lots of things to choose from. 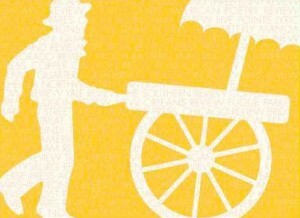 For example, I don’t like shopping at Wegman’s because it’s a huge store filled with many varieties of the same item. When I’m faced with long aisles and many iterations of a product—like yogurt—I start feeling a little anxious and want to leave the store. My body is telling me that there’s too much to process. 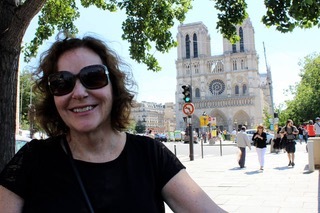 After I returned from the 100Thousand Poets for Change Conference in Salerno, I started feeling overwhelmed by the many obligations and opportunities that waited for me—answering email, booking readings, blogging, writing new poems. I had trouble getting started every morning and more trouble staying focused. So much to do and so little motivation. I was as scattered as the flowers popping up in my garden. My daughter came to visit last week and I told her I felt unfocused and frustrated. 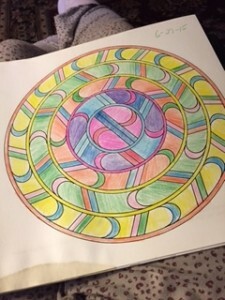 She’s taking an art therapy course and shared what she’s been learning about mandalas. 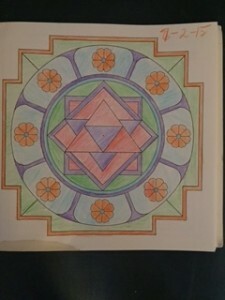 She explained that coloring or drawing mandalas can help you to feel calmer and more centered. “Like having a container,” I thought. And I love to color, especially with colored pencils. She even gave me a mandala coloring book to help me get started. In a previous blog post, I talked about using container poems, or form poems as a way to help the reader and the writer access difficult material. The form of the poem forces the writer to limit word choices and line lengths. Using a formal structure also seems to help contain the difficult feelings or experiences one is writing about. And for the reader, knowing that every third line will rhyme or seeing a phrase repeated throughout a poem reassures the reader that the poet is capable of serving as a trusted guide through difficult territory. So how does a mandala help me to feel centered? I’ve incorporated the coloring as a part of my daily prayer and meditation routine. As I work on completing a segment of the mandala every morning, I get lost in the back and forth movement of my hands as I shade in the designs. I linger over my color choices. I choose one section of the circle to work on and focus on completing it. Maybe the activity of coloring taps into that old part of me that used to love to lie on the floor with a coloring book for hours at a time. Now when I color a mandala, I feel calmer. By completing a couple of sections a day, I see my mandala take on a new form. I think that feeling of calm is transferring over to my writing and enabling me to write or revise a poem every day. One poem at a time, I am moving towards my goal of finishing another book. Here’s a place where you can download mandalas for free. I encourage my readers to color one, take a picture, and post it here so we can all enjoy their beauty.